In recent times we have been extremely fortunate to add some stunning species to our bird of prey family. This week we were indeed tremendously proud to become home for a while to two striking Tawny Eagles. They have come to us from Chris O’Donnell at Hawk Experience in North Yorkshire and will stay with us on indefinite loan. General Manager Andy worked with Chris over twenty years ago and still keeps close links with his Yorkshire roots. The two fully mature Tawny Eagles - as yet nameless (answers on a postcard please) - will stay with us until hopefully they breed, at which point we will then be able to rear some of the chicks here at the Sanctuary. Eventually, Andy hopes to be able to include our own Tawny Eagles in our spectacular, educational flying displays, giving visitors a chance to see the splendour of this truly magnificent raptor. The Tawny Eagle is a sizeable bird, with a wingspan of between 165-185 cm in length, that’s an impressive 5 ½ to 6 foot. It can also weigh up to around 2.4 kilograms, which for those of us who still function in old money is just over 5 pounds in weight. That’s a good couple of bags of sugar or more to have sitting on your wrist! Tawny Eagles belong to the family ‘Accipitridae’, one of the largest avian families, which encompasses many of the diurnal birds of prey including familiar hawks and eagles. With a territory ranging across most of Africa and across tropical southwestern Asia to India, this is a well-established raptor that favours open, dry habitats such as desert and open grassland. Tawny Eagles tend to have quite a varied diet and will eat large, fresh carrion of all kinds, including reptiles and birds the size of guinea fowl. They’re also not averse to a bit of scavenging and have been spotted alongside other large raptors and vultures partaking of a bit of carcass. In fact they’re actually quite happy to steal food from smaller raptors, which apparently puts them in the category of birds known as ‘kleptoparasites’! This species might live to around 45 years of age and will generally mate for life, breeding once a year to produce one to three offspring. Chicks become fledglings at around 84 days, although they can remain dependent on their parents for another six weeks and may even remain with them until the following breeding season. The young are fed mainly by the male and then by both parents once they fledge. 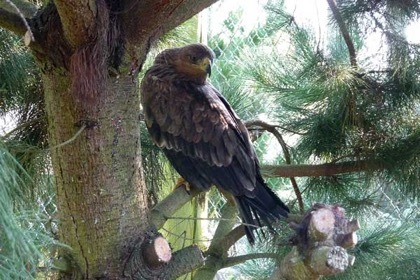 Tawny Eagles are ‘endothermic’, which means they absorb energy from surrounding heat.